Tall buildings are not the only solution for achieving sustainability through increased density in cities but, given the scale of current population shifts, the vertical city is increasingly being seen as the most viable solution for many urban centers. However, the full implications of concentrating more people on smaller plots of land by building vertically - whether for work, residential or leisure functions - needs to be better researched and understood. It is generally accepted that we need to reduce the energy equation – in both operating and embodied terms – of every component and system in the building as an essential element in making it more sustainable. Mechanical HVAC systems (Heating, Ventilation and Air-Conditioning) in tall office buildings typically account for 30-40 percent of overall building energy consumption. The increased efficiency (or possibly even elimination) of these mechanical systems – through the provision of natural ventilation – could thus be argued to be the most important single step we could make in making tall buildings more sustainable. 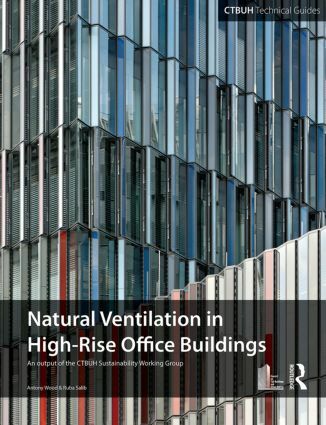 This guide sets out recommendations for every phase of the planning, construction and operation of natural ventilation systems in these buildings, including local climatic factors that need to be taken into account, how to plan for seasonal variations in weather, and the risks in adopting different implementation strategies. All of the recommendations are based on analysis of the research findings from richly-illustrated international case studies. Tried and tested solutions to real-life problems make this an essential guide for anyone working on the design and operation of tall buildings anywhere in the world. This is the first technical guide from the Council on Tall Buildings and Urban Habitat’s Tall Buildings & Sustainability Working Group looking in depth at a key element in the creation of tall buildings with a much-reduced environmental impact, while taking the industry closer to an appreciation of what constitutes a sustainable tall building, and what factors affect the sustainability threshold for tall.